Find out which axe works best for your needs. 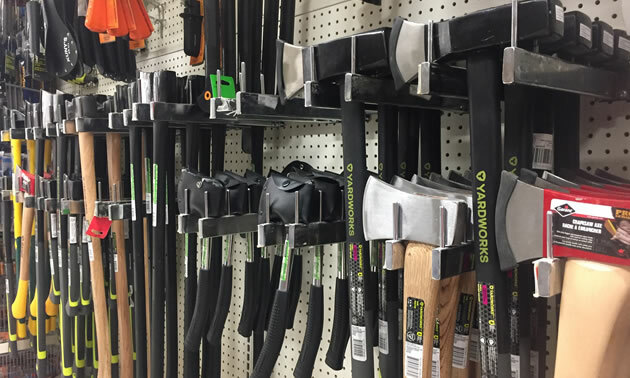 There are basically three kinds of outdoor recreational axes: cutters, splitters and splitting mauls. But there are so many to choose from at the store, how does one decide? My favourite all-round axe today is a Fiskars X27 splitting axe with a 94.1-centimetre (36-inch) proprietary magic-fibre handle and a 1.83-kilogram (4.3-pound) non-stick coated head. It comes with a lifetime warranty, and I keep it under the back seat of my truck. You never know when you might need a really good all-round axe. This one is perfect for six-footers and multiplies your effort with axe head velocity that splits logs like, well, it is impressive. 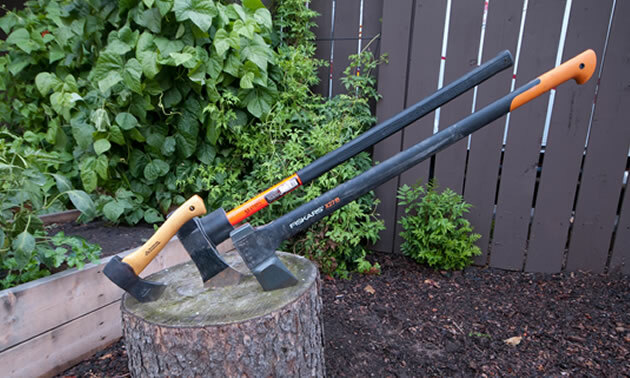 Fiskars makes a variety of axes and I can recommend them heartily. My Wetterlings hand axe fits in my backpack and costs more than all of my other axes combined (as much as a small chainsaw). And it cuts trees down in a pinch. It is a pretty little hand-forged hand axe that is 2.86-kilograms (1.3 pounds) and less than 25 centimetres (10 inches) long. I carry it in my backpack. For kindling production, it cannot be beaten. Sadly, Wetterlings has ceased operation, and the place in Sweden its hand-forged axes were made has become a Gransfors Bruk plant. Gransfors Bruk makes a wide range of forest axes and they too are beautiful, and costly. If you decide to build a log house, Gransfors Bruk has your axe(s). I highly recommend you get at least one of these if you enjoy having good tools that are perfectly designed for a specific task. The third of the trio of my favourite axes is a beast of a splitter that my father left me, a splitting maul. It weighs as much as a sledge hammer, and those big rounds of standing spruce we cut in the summer split fine. You might not need one, but if you do, there is nothing like a maul to split heavy, dense wood. A forest axe or cutting axe has a narrow wedge to bite deep in standing trees for felling. A splitting axe has a wider, steeper angled wedge for quickly separating grains of wood when you are splitting logs. A maul is just more of that wider wedge, with more weight to pack a wallop when you split. My father left quite a collection of everyday hard-working axes. Last year I put them all in the fire to remove their broken and battered handles. When the heads cooled, I put an edge on them sharp enough to cut tomatoes, replaced the old handles with brand-new hickory and sanded them carefully between three coats of marine varnish. I gave Dad’s axes to my boys and kept one for myself, where it lies ready in the storage box of my holiday trailer. Now my boys use them to chop their own firewood. Dad would be proud of all of us. Chilly Jilly is offering a stylish, comfortable new lounge pant, perfect for travelling.